The Charm Of The Waterfall Mangku Milky Sembalun Regions. 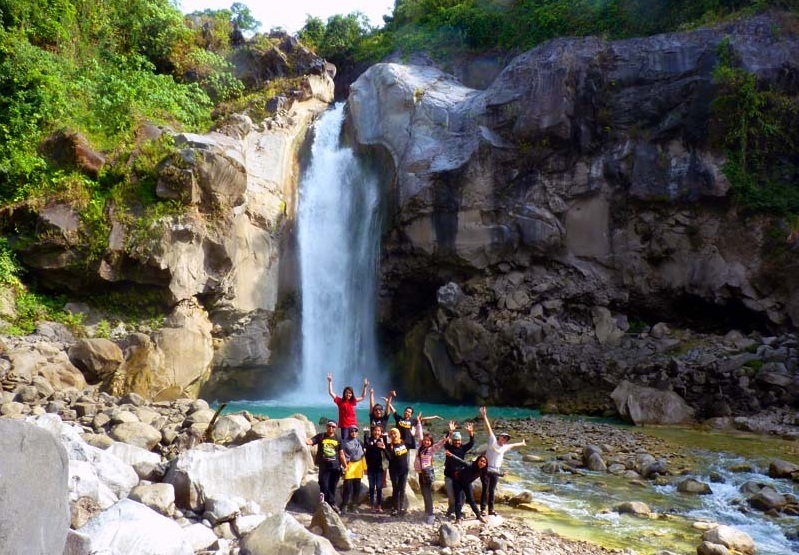 Lombok Island not only presents the beauty of the beach and the mountains, the island is also famous for the beauty of the waterfalls. One of the popular waterfalls is a waterfall currently Mangku Sakti. Located in the village of Sajang, Sembalun regions, this waterfall is located in the National Park of Mount Rinjani. The required mileage from Mataram city about three hours of travel. Waterfall Mangku Sakti is a waterfall that is anti-mainstream with crystal clear water but green Tosca. It is because of the mixture of sulfur at the waterfall. The flow of the waterfall Mangku Kokoq Puteq derived from the Milky water directly from Lake Segara Anak at Mt. Rinjani. This water is believed to be efficacious to cure skin diseases. However, it should be noted that visitors are not allowed to take the sludge sulfur from the waterfall. The charm of the waterfall Mangku Milky can also be seen from the stone walls as the place where the flow of the falls. The height of the waterfall is approximately 40 meters and discharge of water large enough to form a pool with a depth of 2-4 meters. For those who are good at swimming, jumping off the rock into a standing water becomes the experience of riveting. However, it is not recommended for the ability swimming still less because of the waterfall debit hard. For those of you who want to visit the waterfall, Mangku Milky should come in the dry season or seasons pancaroba. The rainy season falls into the murky water with a very heavy flow. In addition, if the rainy season it is feared the road traveled towards the waterfall becomes muddy and slippery. How to get the waterfall Mangku Milky? From Mataram city, you can take the route towards the Sembalun regions, get past the East or north Lombok Lombok. To get an impression of the wonderful journey and the road is better then preferably pass the line East Lombok. After reaching the pusuk Sembalun regions, the journey continues towards the village of Sajang until you find huge billboards with pictures of waterfalls Mangku Milky on the left side of the road. Post ticket purchase Waterfall maintained by indigenous youth Sajang Village. From heading the ticket, you have to pass through a dirt road with rocky contours and uphill about 3 kilometers. This road is not passable by car, but don't worry because the locals provide services for visitors to the entrance area of the waterfall. After reaching the parking location of the motor, you have to follow through the woods for 20 minutes then get to the waterfall Mangku Sakti. We recommend that you visit in the dry season or seasons pancaroba in order not to muddy dirt road. We recommend using taxi ticket from the post to the waterfall because the road that traversed is still bad and need an experienced rider. Do not forget to bring food and drinks because near the waterfall yet many sellers and prices are relatively more expensive. use a local guide so as not to get lost in the forest. Be careful while bathing in the waterfall because it was feared drowned out by whirlpool.